“One thing we all have in common here is that we love our animals and we want to ensure their welfare,” City Auditor Laura Doud said in her introduction to the Oct. 9 meeting of the Long Beach Animal Care Vision Task Force held at the Bixby Park Community Center. The task force was created by Mayor Robert Garcia after an audit of Long Beach Animal Care Services (ACS) requested by his offices showed an immediate need to review resources and maximize revenues to improve shelter performance. The results of the review would be used to establish a strategic plan for the shelter. Everyone at the first open task force meeting did share the goal of improving conditions for shelter animals but viewed the goal through different lenses. The audit comprises 186 recommendations for shelter improvement; multiply that by the number of diverse groups and opinions as well as the degrees of passion and outspokenness, and you have conditions for a lot of barking. However, Gerardo Mouet, the recently hired director of the City’s Department of Parks, Recreation and Marine, conducted the meeting with a firm but open hand, sticking to the ground rules and insisting on respectful listening. The task force includes animal advocates and lovers from all sectors of the community, selected through applications. The objective is to help cobble together a workable plan for the shelter to move forward, with respect to the audit recommendations. Likely, this won’t be an easy task, and more than likely, not everyone will be pleased. But there have been ardent pleas from the pet community for a committee like this one to be formed, and it took the audit to get it rolling. 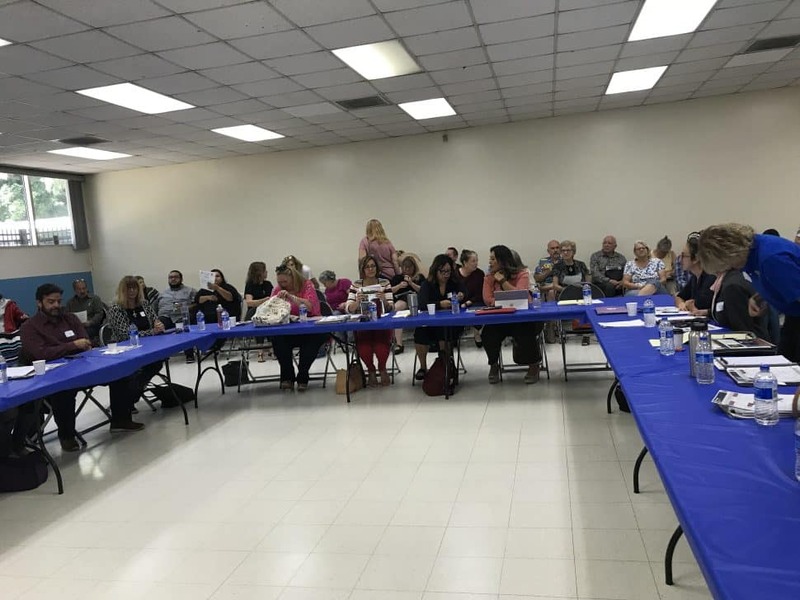 Most of the 20 task force members were in attendance, as were about three times as many public participants from both within and outside Long Beach. Public attendance was three times that of the 20-member Task Force. Photo by Kate Karp. maximizing resources and revenue to capture the necessary funding. Doud said that some of the short-term needs can be immediately implemented: A data-transparency system will be available online to the public to show adoptions, rescues, owner returns and euthanasia procedures. The announcement of the installment of Wi-Fi for the shelter grounds was met with applause—shelter visitors have found it frustrating to snap a photo of a pet they want their family members to come to see and then not be able to send it out. She added that the meeting was for introductory purposes and no work had been undertaken; future meeting dates will be posted. There was a letter included in the agenda that task force members had previously received. The letter identified the points that the mayor wanted addressed: data regarding euthanasia, augmenting the shelter’s volunteer program, focus on adoptions, the hiring of a new shelter manager, defining no-kill and applying its definition to ACS, and reviewing spcaLA’s lease agreement and its relationship with ACS. Mouet gave each speaker a limit of two minutes to speak; the meeting ran half an hour overtime nonetheless. He requested that each speaker be respectfully listened to; off-topic comments went into what he called the “info bin,” a sheet of chart paper on an easel, to be reviewed and considered for later meetings. Comments and discussion included but weren’t limited to addressing staff morale and compassion fatigue, expediting items such as the Kitten Nursery, refurbishing and making better use of the Catio in the Cat Cottages, providing more education around pet ownership and responsible adoption, increasing staff to full time, developing a foster program at the shelter, and growing the volunteer program. One of the audit points was the six minutes of feeding and cleaning per animal provided by ACS, compared with the 15 minutes recommended by the National Animal Care and Control Association (NACA) and the Humane Society of the United States (HSUS). ACS volunteers were both task force and audience members, and the mayor expressed his gratitude for their hard work. Volunteer dedication and diligence, however, were eclipsed in the audit by the report of 6,094 volunteer hours as compared with the municipal shelter in Sacramento, which logged 97,147—almost 16 times less. There simply aren’t enough volunteers. 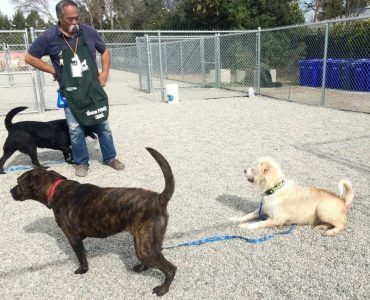 ACS volunteer Gary is an effective playground monitor at the shelter’s Dog Play Yard. Photo courtesy of ACS. Ted Stevens, ACS’s manager since 2012, will be returning to the recreation division of the Parks, Recreation and Marine department as superintendent of recreation. He’s particularly anticipating working with senior citizens. Stevens isn’t leaving the animals behind—he’s considering such ideas as giving seniors the opportunity to foster animals, and learning about and volunteering to bottle-feed newborn kittens. Seniors can be as passionate as animal advocates—they just have time to nap more often. Meanwhile, the hiring process for the new shelter director is underway. Mouet has the responsibility of selecting a manager from a group of finalists that were chosen by a panel of experts from a pool of 78 applicants. “There is no more important decision that will be made about the future and direction of the shelter,” Mouet said. Task force members and public attendees gave input on the selection of a new shelter manager. “It shouldn’t be an absolute that the new manager has to have shelter-management experience,” said task force member Anna Wong, Stray Cat Alliance’s Long Beach program director. Wong cited Orange County Animal Care manager Mike Kaviani and Gina Knepp, Animal Care Services manager at the Front Street Animal Shelter in Sacramento. Kaviani had nine years of experience as a canine behaviorist and director of lifesaving operations at Austin Pets Alive! (APA) in Texas but never managed the facility or any other; Knepp was virtually thrown from a management position in law enforcement into managing a flailing municipal shelter when the Front Street Shelter needed a “fixer.” Both Austin and Sacramento are considered as gold standard in euthanasia reduction and live release of animals. A request from a task force member for the committee to view the resumes and qualifications of the top five candidates with names redacted was denied for confidentiality reasons. Funding: Can resources be better managed? Phase 2 of the audit stated that limited staffing and insufficient citation-collection efforts feed into the limited shelter operations. Nearly two-thirds of the $938,000 worth of uncollected fees and fines owed since 2009 were rendered uncollectable by statute of limitations, but that still leaves $362,463 that can be collected and utilized. Task Force member April Devane wondered whether the cost of capturing the errant funds would exceed the funds themselves; Mouet promised a thoughtful review for a balanced approach to revenue capture. However, this leaves the shelter still underfunded. The audit recommended that “more effective management of revenue-generating operations could allow for much needed additional funding.” Doud mentioned that the one-time sum of $50,000 allotted to this year’s budget through an approved motion by 5th District Councilwoman Stacy Mungo, which was intended for use in implement the audit, will go toward hiring a consultant who will help implement the plan. “We can’t promise additional funding,” Doud added. To plump up the shelter kitty, task force members suggested fundraising. Pet educator and task force member Judy Crumpton has in the past spearheaded six successful fundraisers, to raise money for spay/neuter assistance through the ACS voucher program. Fundraising is usually done by the Society for Prevention of Cruelty to Animals, Los Angeles (spcaLA), located in the same building as ACS. The mayor’s statement was met by audible approval from the audience. SpcaLA is a private rescue that shares the P. D. Pitchford Companion Animal Facility with ACS. The two entities are frequently mistaken for each other by visitors, and spcaLA’s role as a partner with ACS has been an oft-gnawed bone of contention among animal advocates. What is no-kill, and how can we reach it? “There would be more grant opportunities if no-kill is in our vision,” said Fix Long Beach board member Diana Kliche. The term no-kill has evolved from a buzzword and a pipe dream to a philosophy and a genuine effort on the part of shelters, organizations, rescues and members of the pet-welfare community to bring euthanasia numbers way down and to increase positive outcomes for pets. How it will be defined is a central concern of the task force and the animal community at large. Like the poem about the blind man and the elephant, there isn’t just one perception of no-kill, but it is indeed an elephant in the room, and no one’s ignoring it. Best Friends Animal Society defines no-kill as “euthanizing only the adoptable animals with severe, irreparable medical or behavioral issues.” Some shelters and organizations define no-kill as a percentage of animals who aren’t subject to euthanasia and are released to owners, sent to rescues or adopted. Best Friends and other entities cite a percentage rate of 90 percent as a benchmark for live release. Most shelters and rescues that house and foster cats and dogs until they’re adopted become overwhelmed with issues of space, finances, and physical, mental and emotional exhaustion that accompany the numbers of pets that they’re asked to accept. When such facilities and rescues run out of room and the owners or finders run out of options, the pets may be dropped off at open-admission shelters such as ACS. An open-admission shelter will keep an animal for an amount of time; if the pet isn’t adopted or claimed and they run out of kennel space, the pet may be euthanized. Even though there was agreement in spirit for no-kill, some task force members debated branding the shelter with it. Dr. Patricia Turner, the leader of No Kill Long Beach (formerly Stayin’ Alive Long Beach) is an ardent supporter of no-kill policy, both in name and in policy. Turner has a following among members of the animal-advocacy community; she’s done statistical research on ACS for five years and has often butted heads with shelter management, city officials, the media (including this writer) and other members of the community. Although she hasn’t lived in the city for years, she said that Long Beach animals have never left her heart. “Long Beach is an amazing animal-loving community,” Turner said. “We don’t have to reinvent the wheel.” She cited Best Friends’ definition, stating that pets with treatable conditions such as upper-respiratory infections, ringworm and mange should not be euthanized but healed. “Even larger issues can be addressed, with the financial means to do it,” she said. She suggested that the new manager be proficient in applying for grants and leveraging the community. More elephants: Where do shelter animals come from? One item that wasn’t on the agenda concerned what fills up shelters in the first place. TNR means “trap-neuter (and spay)-return. Volunteer groups and individuals trap stray and feral cats and alter them along with any kittens born to the mothers. The kittens are usually able to be adopted out, and the adult cats are returned to where they were trapped, their faucets shut off forever. Cats are prolific mammals—females can become pregnant at six months old and can breed three times per year, according to the ASPCA. At an average of four kittens per litter, continual kitten births inundate shelters. Dogs that are left to mate or bred for profit also figure in to overcrowding. When the bred-out dogs and “surplus puppies” are abandoned to the streets, they often wind up in shelters where they linger with other strays and owner returns. Mouet said that spay/neuter and enforcement will be addressed at the next meeting, which will also involve strategic-plan development. The next meeting of the Long Beach Animal Care Vision Task Force is scheduled for Tuesday, Nov. 13, at 11 a.m. and will be held at Recreation Park, 4900 E. 7th St., Long Beach.